I generally try to avoid writing book reviews here, but the fact that there are so few books available on Power Query and M means that I’m making an exception for “Collect, Combine and Transform Data using Power Query in Excel and Power BI” by Gil Raviv. The first thing to say about this book is that it takes the approach of teaching through exercises and worked examples, rather than by explaining abstract concepts. If this suits your style of learning (and I know that it does for a lot of people) then you’re in luck; if you’re looking for a book that will explain what all the different join types for Merge operations do, for example, then you’ll be disappointed. This isn’t a criticism though – I don’t think it’s possible to write a book that will satisfy everyone – and Gil has done a good job of covering a lot of common data preparation scenarios. One important exception to this is the chapter on M which provides a very clear introduction to the language and the way it works. I suspect a lot of people will want to buy the book for this chapter alone. The second thing to say about this book is that while it covers both Power Query in Excel and Power BI, in my opinion it’s aimed slightly more at Excel users. Again, this is not a criticism: although advanced Excel users and Power BI report designers have to solve many of the same problems, they also have some very different concerns too. What’s more, if you can assume your readers have good Excel skills and can explain Power Query concepts in Excel terms then you’ll serve that particular set of readers well, and probably do a better job for them than if you assume they are completely new to the area of data transformation and preparation have no existing skills in this area. All in all it’s a good book that I can recommend to anyone who wants to learn Power Query and M, and also for intermediate users who want to deepen their knowledge. I still think there’s a need for a book completely devoted to M and covering topics such as custom connectors and dataflows; hopefully someone writes one soon! Full disclosure: I received a free copy of the book from the author. I’m also the author of a Power Query book myself, but to be honest it’s several years old now and a bit out-of-date, so it’s hard to recommend it any more. You can buy a copy of this book from Amazon UK here. I know what you’re thinking: why is Chris blogging about a book on Biml when he’s not remotely interested in SSIS? Well, you’re right, SSIS isn’t my thing (though as an SSAS developer it’s important to keep up-to-date on the tools that the SSIS people on your team use) and yes, as you may have guessed, I got a freebie review copy because I’m an Apress author and I’m friends with one of the authors, Andy Leonard. There is, though, a good reason why I want to learn about Biml: you can use it to generate SSAS databases as well as SSIS packages. First of all, the book itself. “The Biml Book” is a new book written by a team of Biml experts that teaches you pretty much everything you need to know about Biml. I’m always a bit worried by books with a large number of authors because I know how difficult it is to maintain a consistent style, but in this case I couldn’t see any joins. As someone with no previous experience of Biml. I found the book very clear, concise and easy to read. I highly recommend it as an introduction to the topic. Biml can be a great fit for Analysis Services use cases, but there are some exceptions. Just as with SSIS, one of the great advantages of Biml is that it easily allows scale-out architectures through automation. This makes it a good choice when it comes to multi-tenancy and/or multi-server environments. Given the ability to automate structures and deployments through metadata, Biml frameworks can also include cube projects that can be driven with some of the same metadata that was used to build data integration frameworks. Conversely, SSAS Multidimensional/Tabular can require the specification of additional types of metadata to automate its creation. After all, cubes and tabular models are largely just metadata containers on top of relational structures. If you want to use your own metadata to drive the creation of bespoke SSAS projects that could support any SSAS feature, you essentially need to duplicate the entire SSAS feature set in your metadata store. This will result in complex models that may be very difficult and time-consuming to maintain, potentially leading to longer instead of shorter development and deployment times. In a nutshell, Biml isn’t for all SSAS projects, but for the pattern-heavy, scale-out projects where it does fit, it’s tremendously valuable. I’ll give you an example of where I think Biml and SSAS make a good match. I’ve worked with several companies who do what I call B2B BI: they create, host and manage Microsoft BI solutions for their customers. They have a standard template solution that connects to a particular type of data source (for example, their customers’ Dynamics databases), builds a data warehouse and then puts SSAS and maybe some reports on top. As a result they end up with multiple copies of the same solution, with the only difference being that each copy contains a different customer’s data – a classic example of a “multi-tenancy and/or multi-server environment” as described in the extract above. This style of BI will become more and more common in the future because cloud-based services like Azure SSAS and Power BI (both now support Azure AD B2B) make it much easier to implement, and I think Biml could play a very important role here: you don’t want to build and manage hundreds of near-identical SSAS databases, and their supporting ETL, manually. “Expert Cube Development” Second Edition Available Soon! 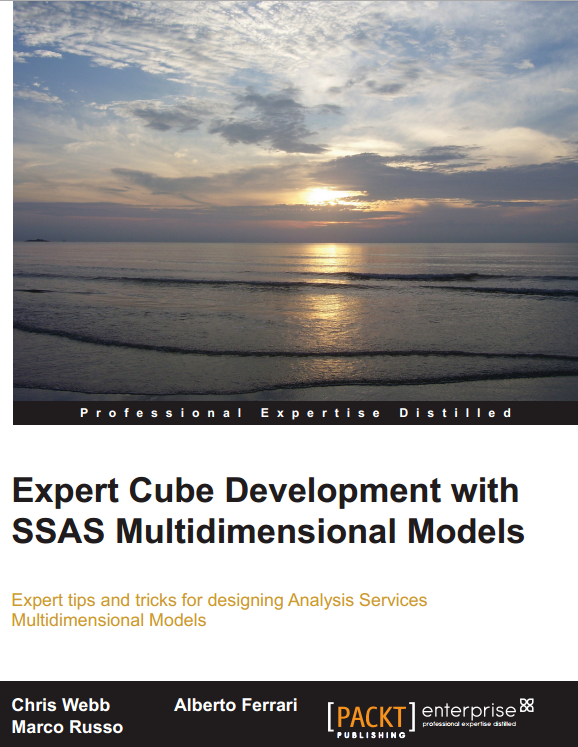 Within a matter of days, “Expert Cube Development with SSAS 2012 Multidimensional Models” will be published. It’s the second edition of the very successful (19 5* reviews on Amazon US as of now) book on SSAS cube development that Marco, Alberto and I wrote a few years ago, updated for SSAS 2012. You can pre-order it now from the Packt website, Amazon US or Amazon UK. This is basically the same book as the first edition with updated screenshots, a few bugs fixed, and several sections updated/expanded for SSAS 2012. There are no substantial changes. If you already have a copy of the first edition it’s probably not worth buying a copy of the second edition. The book only covers SSAS Multidimensional models, it does not cover SSAS Tabular models. This is not a basic introduction to building SSAS cubes – it’s aimed at intermediate-level SSAS developers who are already familiar with cubes, dimensions and MDX and who want to learn about best practices, design patterns, performance tuning and (most importantly) which features work well and which ones don’t. If you like the material I post here on my blog, you’ll probably like the book. If you’re OK with that then by all means, go ahead and get your wallet out! Microsoft SQL Server 2012: The BISM Tabular Model is now available to buy! I decided to wait until I had a real, physical, made-of-dead-tree copy of it in my hands before blogging, but I’m pleased to announced that the new book that Marco, Alberto and I wrote on SSAS 2012 Tabular models is now available to purchase (even though, as Marco says here it was actually officially released a few weeks ago). You can buy it all all good bookshops, including Amazon UK. It has two five-star reviews on Amazon already, and Javier Guillén wrote a very detailed review here. Why not buy several copies so you can share it with your colleagues, friends, significant others, children, neighbours etc? It also makes ideal beach reading if you are currently on your holidays. You may also have noticed there’s another SSAS Tabular book out, by Teo Lachev. Teo is an author I have the utmost respect for and I’m a big fan of everything he’s written; this book lives up to the high standards of his previous work. While it’s true there’s some overlap between his book and ours, the focus of his book is broader, covering topics such as Sharepoint, whereas ours has a narrower focus and goes into much greater detail on subjects such as DAX; so (again, as Marco says) you should probably consider buying both.